It can be a valve to release inner tensions. Quote: "Freewriting is the easiest way to get words on paper and the best all-around practice in writing that I know. To do a freewriting exercise, simply force yourself to write without stopping for ten minutes. Sometimes you will produce good writing, but that’s not the goal. Sometimes you will produce garbage, but that’s not the goal either. You may stay on one topic; you may flip repeatedly from one to another: it doesn’t matter. Sometimes you will produce a good record of your stream of consciousness, but often you can’t keep up. Speed is not the goal, though sometimes the process revs you up. If you can’t think of anything to write, write about how that feels or repeat over and over 'I have nothing to write' or 'Nonsense' or 'No.' If you get stuck in the middle of a sentence or thought, just repeat the last word or phrase till something comes along. The only point is to keep writing. . . .
Want to try some freewriting exercises? Go to www.oneword.com and try the exercise. There’s a new prompt every day. I’ve done it a million times... and it only takes sixty seconds! It's a writing practice that I used to do a little, but I've tended to ignore it more recently in favour of more structured stuff. I sort of do that with my blogging, especially when I write out my posts on paper. l did not know what my style was called now l know. Even doing a trailer for my book, l went free style and well sort of edited the video. 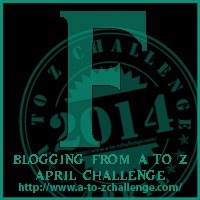 A to Z April Challenge has encourage freewriting. Great insights! I'm a big fan of freewriting. Most of my stories emerge from this. I saw this sort of practice mentioned on one of my blogger buddies' blogs. She said it was kind of a mental spewing out of random thoughts so she could clear it all out and then get down to the real stuff. Seems like a good idea to me! Hi Michelle - being a typist it doesn't sit right when I free-write, as I know when I've made a mistake and want to correct it - and I want to set my work out .. so it's got paragraphs, sentences and capital letters, words spelt correctly and so on .. free-writing just goes against my grain. When I'm sailing fair .. I just write .. I love freewriting! I don't get a chance to do it often enough. I really enjoy freewriting. I use it as a warm-up and usually do it first thing in the morning. I'm still groggy and it let's the freewriting flow easier. That's a great exercise to try when the inner editor becomes a tyrant. Thanks for the tip! Not making corrections is where I fully fail. Grr... Got to get rid of that perfectionism bug. I used to freewrite all the time. It's a great way to get the writing muscles moving. I write 200 words at a time - straight through - no editing. It takes me 5 minutes to do it. Therefore, it takes me 25 minutes to write 1,000 words. Then I move on to article writing or laundry or something. Then I come back and do another 1,000 words. Then on to something else. Then back to another 1,000 words. . . I can get 5,000 words or more done this way. The editing and everything comes later. Freewriting is the bomb! I love free writing. I've always called it brain storming. It's great for clearing out the ol' brain. Free writing is okay...except, I can't NOT edit or reread as I go. I think Nanowrimo is one long freewriting session. Thanks for your post! I love freewriting as a way to flex creative muscle and just get myself going. What a good reminder. It's so hard for me to just keep going without editing or pausing to think and plan. I should practice freewriting more often. wow! this sounds like a great technique. must share this post with my writing site, hexbound. I've never tried that but what a great idea for a writing teacher. I can see even high school kids enjoying that. NaNo is a form of freewriting, though it usually is practiced with more structure in mind. The concept is similar, though. Visit us during the A to Z Challenge. We are highlighting authors who are more than writers. Click HERE. Good advice, it's a technique I rarely use but I'll have a go. Thanks! I am a bigtime lover of freewriting. I've been using it as a personal writing tool and a way to reach creative breakthroughs. I appreciate reading your post today a lot! You asked about the Artist's Way, interestingly enough, one of Cameron's methods in the book is free-writing 3 full pages every morning. I've been doing them since September... it's like meditation. Empties my head, disarms the inner critic. Then I can go about my day much more smoothly. We did a lot of free writing at the retreat I went to last fall. It was fun, but old hat. I keep a journal, so I feel as if I'm always free writing. Or whining. I do this a lot when I just can't think of something else to write. As weird as it sounds, I don't think I've ever tried that. I always sit down with a purpose in mind. Sometimes I do this to get started with a novel. I enjoyed the post! LOVE the oneword site. I've seen it before but forgot all about it. Nice addition to your post! I've used this technique at times to flush out an idea that isn't fully formed. Or for writing exercises. I find it a helpful tool. Thank you to everybody who visited today! I appreciate you stopping by to leave a comment! I've never done it before...I want to try! We did this all the time in Creative Writing Club at my first high school. Sometimes I used pre-existing characters or thoughts; other times I just free-associated. One of our guidebooks was Natalie Goldberg's Writing Down the Bones. We also used something by Peter Elbow.